Anyone that has read this column long enough will know that I love to extol Magic's greatest strength as its ability to be a different game for wide variety of players. It's a testament to the game's flexibility and the ingenuity of players to find new ways to Lighting Bolt and Counterspell each other. For an ever increasing number of players, that has been to break the game out of the one-on-one mold. Whether it's adhoc free-for-all games at the kitchen table or more structured play like Archenemy, Magic players have been gathering around one big table to play all together. Hot on the heels of Commander 2015's release, we caught up with Ben Hayes to talk about Magic's many multiplayer formats and the various aspects of playing the game with more than two players. Ben is a game designer with Magic's R&D division and the lead on the final game design and development for Commander 2015. 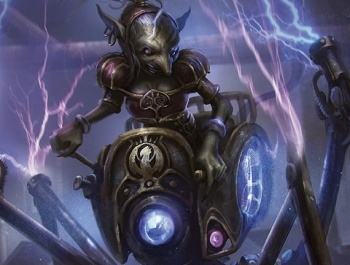 The Escapist: With the now yearly release of Commander, supplemental product like Conspiracy, and recent reveal that Oath of the Gatewatch will highlight 2HG, is it safe to say that there's increased emphasis on multiplayer Magic recently? Ben Hayes: In any given set there are cards that appeal to a wide variety of play styles, and we try to have our emphasis match our audience. It's clear that there is a very real audience for multiplayer Magic, so we want to make things to delight our players. 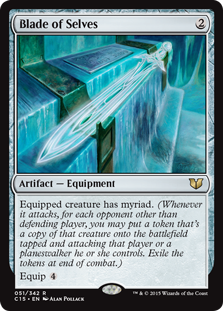 For example a card like Mystic Confluence can be appealing in multiplayer because of its versatility as well as an environment like Cube because of its power and efficiency. Another card like Blade of Selves, which scales with the number of opponents you have, can be extremely appealing for multiplayer while not impacting head to head games at all. The Escapist: Why this increase and what are some of your favorite ways to play with a group? Ben Hayes: Magic is a game that brings people together, and multiplayer formats allow for everyone to interact on another level with each other. We want to meet the demands of our broadening audience and continue to make a game that is fun for everyone. For 2HG I like having the opportunity to play on the same team as the friends I've made through playing Magic, since in most other situations involving Magic I'm playing against them. It's a fun change of pace. Commander is a format I played on and off before coming to Wizards. I enjoyed building decks and reading about the format but didn't actually play it that often. After I heard that I was going to be leading the development of Commander 2015 I started playing Commander regularly at local stores and on Magic Online to become more familiar with the format and in that time I grew to like it even more. The Escapist: What's your ideal number of players for multiplayer? At what player count do you find the basic actions of Magic start to move too slowly? Ben Hayes: Three or four, depending on how experienced the players are. I think four can be overwhelming for newer players but is my ideal number if everyone knows the ropes. Five is where things typically slow down more than I enjoy. The Escapist: What advantages, and hurdles, do multiplayer formats have over the more traditional head to head ones? Ben Hayes: The biggest advantage is that the power level of individual cards and strategies can be offset by fun collaborations and social dynamics. If someone is assembling a devastating combo or position in a one-on-one game it's entirely on their opponent to react or lose, but in a multiplayer game the table can work together against players who pull ahead which can keep a game interesting, interactive, and competitive for longer.